JAXA | Ulrich Reininghaus Project Manager, Mercury Exploration Mission BepiColombo, ESA "Europe and Japan:Together to Mysterious Mercury"
Ulrich Reininghaus Project Manager, Mercury Exploration Mission BepiColombo, ESA "Europe and Japan:Together to Mysterious Mercury"
JAXA and ESA have been working for years on a joint mission to Mercury called BepiColombo. Mercury is a rocky planet like Earth, but it’s one of the toughest planets to get to know. Because it’s the closest planet to the Sun, it gets extremely hot during the day, and it is bombarded by high levels of solar radiation. The BepiColombo mission consists of two probes: the Mercury Magnetospheric Orbiter (MMO), whose main objective is to observe the planet’s magnetic field and magnetosphere, and the Mercury Planetary Orbiter (MPO), which will observe Mercury’s surface and interior. 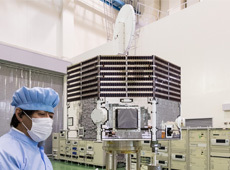 JAXA is responsible for the development and operation of the MMO, and ESA is handling the MPO. 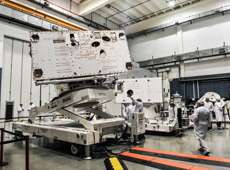 The MMO is scheduled to be transferred to Europe this spring, and BepiColombo is scheduled for launch in Fiscal Year 2016. 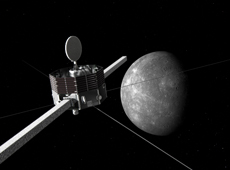 We interviewed ESA’s acting project manager for BepiColombo. — What is the purpose of BepiColombo? and the possible presence of ice at Mercury’s poles. Our first good look at Mercury happened when Mariner 10 got close to it in 1974. The Italian scientist Giuseppe Colombo had figured out how to get Mariner in position to do several fly-bys, and so this mission is named in his honor. Mariner 10 mapped about 45 percent of Mercury’s surface, but so far that’s all we have managed to do, so this mission is long overdue. Mercury is the closest planet to the sun, and plays a fundamental role in the testing of theories explaining the formation and evolution of the whole solar system. But there isn’t very much we can learn about it using telescopes. It is visible for only two hours a day, at a very low altitude either at sunrise or after sunset, and this makes it inaccessible to the large ground-based telescopes. It’s also inaccessible to the Hubble telescope. No one can take measurements this close to the sun. — What’s the current stage of development for the modules that ESA is working on? 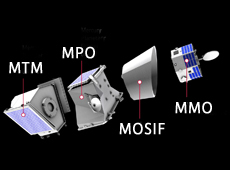 In addition to the MPO, we are in charge of developing the MMO sunshield and the Mercury Transfer Module (MTM). We have completed the thermal test of the MPO. And we have also done some initial thermal assessments of the spacecraft as a whole, which indicate that its performance matches expectations. This is a major achievement for the project, since the main challenge for this mission is heat. 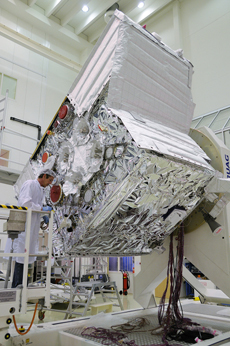 The Magnetospheric Orbiter Sunshield and Interface Structure (MOSIF), which protects the MMO from solar radiation, is currently on schedule to be completed in time for the integrated test this spring. There is a slight delay in the development of the MTM, but we will do our best to make sure this does not interfere with the launch. At the integrated test, we will build the full assembly, starting with the MTM, then the MPO, and the MOSIF and MMO on top – the same as the actual mission. With this configuration, we will do vibration and acoustic-noise testing. After confirmation, the MPO and MMO will be transported to the Kourou Space Center in French Guiana. We will do final testing at the launch facility, and the MPO and MMO will be launched together on an Ariane 5 rocket in 2016. 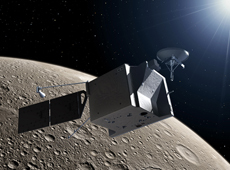 It will take about seven years for BepiColombo to reach Mercury. — Mercury is the planet that is nearest to the sun, and very hot. What were some of the problems you had to solve to prepare for that? Heat is indeed the main concern about Mercury, and don’t forget it also has a very harsh UV environment. The sunlight around Mercury’s perihelion is 10 solar constants – that means 10 times stronger than near Earth. Providing enough thermal protection has been very difficult. The initial thermal-environment test of the MPO failed, and required a significant redesign of the thermal blankets – the outer skin of the MPO, which is known formally as MLI, or multi-layer insulation. We had to find a way to fix the MLI onto the spacecraft to avoid parasitic heat leaks. This delayed the launch by several years – it was originally scheduled for 2013. We redesigned and rebuilt the MLI: we changed materials, we changed the interior, and we reduced the number of sewing lines. (These sewing lines are needed to keep the MLI together, to integrate the layers of foil.) It was very difficult. Finding the right materials for the skin was complicated. The MLI has ceramic elements to survive the heat. The material has to be light because mass is an issue, as it is for any spacecraft. And it has to provide the necessary level of protection, not just from heat and UV radiation, but from micrometeorites. This is why our MLI has up to 28 layers. The solar array cells were another challenge, because the degradation of the cells in the UV environment was observed to be very high, and we had not known that this could happen. It took us several years to solve this problem. Another element was our high-gain antenna, which developed deformations under 10 solar constants. There were simply not enough prequalified technologies for Bepi, and the available data didn’t meet our needs. We ended up charting new territory, and we needed new facilities for the tests. We did pathfinder work, which was not planned for, of course, and this took time. But the results from the most recent test were excellent, and I think it was worth the effort. — What are some of the other challenges you faced? It takes seven years to reach Mercury after launch, so one of the challenges is preparing for such a long flight. One of the main problems is that the modules have to remain stowed for a long, long time before we separate them. They are squeezed, pressed against each other with spring forces, and will be released by pyros and other, non-explosive devices, and they have to separate properly after seven years, without having cold-welding effects and other issues. When you have two materials pressing against one another, a lot can happen from vibration or acoustic noise, etc. So we had to develop special coatings. We made all the mistakes you could imagine, but now we think we have a reliable mechanism, and reliable surface coatings, at least to not have these risks in the future. Development of the MTM transfer module was also difficult. The system uses an inert gas system to ionize xenon and create plasma – it’s similar to the grid-electrode system in the asteroid explorer Hayabusa. We had three challenges. First, the seven-year cruise phase, which poses lifespan challenges for the grids. Second, redundancy and autonomy. With Bepi, we often have periods without ground visibility, and that means the system has to be able to function autonomously. Implementing multiple levels of redundancy has resulted in enormous system complexity. For example, the ion engine has four thruster pairs coupled with two independent power processing units, and if anything fails, we can reconfigure this completely into any combination. And this leads me to challenge three: if you built this, you have to test and verify it. You even have to implement failures to see how the system behaves. This is complex, this is difficult, and this takes a lot of time. — MESSENGER orbited Mercury in March 2011. How has it influenced your mission and the observations you hope to make? It hasn’t changed our mission – the designs were already set by that time – but MESSENGER’s observations will change our operations profile. 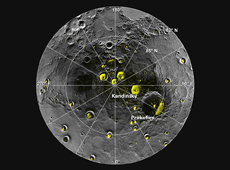 MESSENGER discovered Mercury’s tectonics and traces of volcanism, the polar deposits that we think could be ice, and unexpected amounts of potassium on the planet’s surface. But the most surprising discovery has to do with Mercury’s magnetic fields: the poles are not where we assumed them to be – they have a drift of about 400 km. We will do a deeper analysis to find an explanation for this. So we are using MESSENGER as a pathfinder for us, to really let us know where to look. — What are the challenges of working internationally? Collaboration with other space agencies was always an objective for ESA and will be in the future. Whether we are working with NASA, Roscosmos, the Chinese, or JAXA, collaboration continues to be our priority focus. The main reason, of course, is that space exploration is expensive, and collaboration at least ensures that there is no duplication of effort, which is a waste of money. And also, our missions are so demanding and complex that they really need the best scientists in the world to work together. Of course there are big cultural differences and differences in work style between different countries. It can be difficult, but extremely valuable. — These days, how difficult is it to get government support for space science in Europe? At ESA, our budget is approximately 500 million Euros. We have resources dedicated to solar-system science, planetary research, and fundamental physics. And this also covers missions, operations, and operating costs of course, and we strive to maintain a balance among the various scientific interests and opportunities. We find it a pity that JAXA has reduced its budget for planetary science. It’s a difficult thing to say, but I see a risk that they will lose technological capabilities. They didn’t reduce funding for BepiColombo, but I’m afraid they may have reduced opportunities for collaboration with ESA on future planetary missions. It is true that space exploration is a luxury. We do not ask ourselves whether whatever we find on Mercury could lead to something that might change the world. It is really driven by humankind’s scientific interest in understanding where we come from and where we may be going. This is why it’s difficult to explain to people why we invest so much money in space science. When we have a better understanding of the magnetosphere of Mercury, it will not change anything in the world, but it will at least allow us to better understand how our universe, our solar system was formed. I can give you the precise date when I became interested in space. It was the 20th of July, 1969. 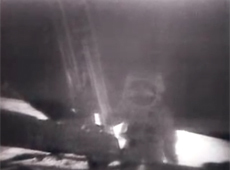 That was the day Neil Armstrong walked on the surface of the moon. I remember watching it on television. I saw it at home on a black and white screen, it was a very bad transmission. But I saw it, and this was the moment that clicked for me. “Wow,” I said, “This is fantastic!” And from that point I had an increased interest in physics and mathematics. I was 12 years old at that time, and later on I naturally studied physics and electrical engineering. That’s why we need to continue space exploration – it inspires scientific learning and achievement. — What are your expectations for JAXA? I want them to continue to have successful missions. We have a longstanding relationship with JAXA. On the BepiColombo project, we have a very good working relationship with them, developed and maintained for many years. The JAXA people are considered to be reliable partners, and they have proven to be experienced and very professional. So we are happy to work with them as a team. I want to have new opportunities for JAXA and ESA to continue to work together. And I hope that JAXA continues to be a reliable and trustworthy partner. For me personally in the next few years, I wish for an ongoing positive partnership for the entire BepiColombo Mission. Ulrich Reininghaus graduated with a Dipl.-Ing. degree in electrotechnology and physics from the University of Wuppertal. He spent 23 years at Astrium, the aerospace subsidiary of the European Aeronautic Defense and Space Company, as Quality/AIT manager. In 2006, he moved to the European Space Agency, to work as spacecraft manager on the Herschel Space Observatory project. He joined the BepiColombo mission in 2010, heading up development and integrated testing. He has been Project Manager of BepiColombo since 2014.